The Swan Valley Oasis Resort: a family business offering outstanding hospitality to all our guests since 1992. The Swan Valley Oasis Resort. Close to Perth Airport and City. Situated in Henley Brook amongst wineries, breweries, attractions and restaurants in Perth’s premier wine growing region. Accommodation; Licensed Restaurant; Wedding, Conference and Function Venues; Brewery; Supa Golf; Laser Combat Games and Aboriginal Art Gallery all on the one site. The perfect place to stay & unwind. 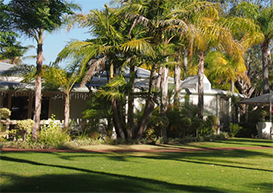 Located within the Perth Metropolitan area but with a relaxed country ambience. A real oasis of 73 acres surrounded by wineries, breweries, restaurants, attractions and local produce. Some within walking distance, and most only a short drive. The historic town of Guildford with its colonial buildings and antique shops is the gateway to the valley. Only 25 minutes from Perth City Centre.